Early reports suggest that a bird strike caused a jet plane to crash in the Hudson River near Manhattan today, leaving questions about how a little flying animal could down a big airliner. More than 200 people have been killed worldwide as a result of wildlife strikes with aircraft since 1988, according to Bird Strike Committee USA, and more than 5,000 bird strikes were reported by the U.S. Air Force in 2007. Bird strikes, or the collision of an aircraft with an airborne bird, tend to happen when aircraft are close to the ground, which means just before landing or after take-off, when jet engines are turning at top speeds. The incidents are serious particularly when the birds, usually gulls, raptors and geese, are sucked into a jet engine and strike an engine fan blade. That impact displaces the blade such that it strikes another blade and a cascade can occur, resulting in engine failure. A 12-pound Canada goose striking an aircraft going 150 mph at lift-off generates the force of a 1,000-pound weight dropped from a height of 10 feet, according to Bird Strike Committee USA. Today's incident, which occurred just after US Airways flight 1549 (an Airbus 320) had taken off with more than 150 passengers and crew members from LaGuardia Airport in New York, en route to Charlotte, N.C., involved a flock of geese, according to CBS News. Reports indicate no deaths or serious injuries as of this writing. Large aircraft are certified to be able to keep flying after impacting a 4-pound bird, however 36 species of birds in North America weigh more than this, according to the committee. Even smaller birds, such as starlings, can cause engine failure. The greater the difference in the speed of the plane and the bird, the greater the force of the impact on the aircraft. The weight of the bird is also a factor, but the speed difference is a much bigger factor. Flocks of birds are even more dangerous as they can result in multiple strikes. Dale Oderman, associate professor of aviation technology at Purdue University in Indiana says birds can be very dangerous to aircraft, particularly in the first several thousand feet after take-off, where the birds are flying. "Obviously, geese or another large bird would be much more hazardous than a little black bird," Oderman said. "The speed at which the two are moving causes the bird to get ingested into the engine. And the engine is very delicate to withstanding a major impact." He added: "It just shuts the engine down." Basically, if the birds get too close to the engine's intake, it's like a vacuum - the birds just get sucked in. "The initial stages of a jet engine are made up of a lot of compressor blades. Those aren't very big and they can be very easily damaged," Oderman told LiveScience. "Even if one of those things breaks off, then the one blade will go through the rest of the engine and it's like shrapnel to the engine." 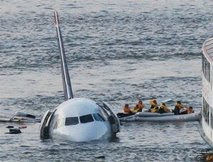 And in the case of the Hudson River crash, the birds apparently took out both engines. "Apparently in this particular case it seems both engines were hit. If it was a flock of birds they flew thought it wouldn't be a surprise to me," Oderman said. Airports, Oderman said, take several precautions to keep planes safe from birds. For instance, they often don't plant many trees nearby, as these are nesting areas for birds. Since La Guardia is right on the water, he noted, there are a lot of water birds around. Bird strikes are on the rise, according to the committee. After a bird strike in the United States, the remains, called snarge, are sent to the Smithsonian Institution's Feather Identification Laboratory to identify the species, according to WikiPedia. Bird and other wildlife strikes to aircraft result in more than $600 million in damage a year, according to Bird Strike Committee USA. Five jet airliners have had major accidents involving bird strikes since 1975, the committee says. In one case, about three dozen people died. NASA worries about bird strikes, too. During the July 2005 launch of Discovery on mission STS-114, a vulture soaring around the launch pad impacted the shuttle's external tank just after liftoff. With a vulture's average weight ranging from 3 to 5 pounds, a strike at a critical point on the shuttle - like the nose or wing leading thermal protection panels - could cause catastrophic damage to the vehicle. NASA put safety measures into place in 2005 to reduce the odds of bird strikes with the shuttle. The agency particularly wants to avoid bird strikes to the shuttle's fuel tank that could damage the heat shield during launch and landing. For instance, NASA has a special during launch countdown where they can stop to wait for birds to pass. And during landing, NASA has a sound cannon that they fire to make sure the runway is clear from birds to make sure shuttle isn't damaged during landing.